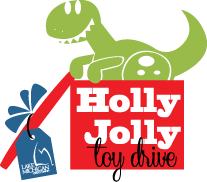 News from LMCU: Oh by golly, have a Holly Jolly Toy Drive this year! Oh by golly, have a Holly Jolly Toy Drive this year! Sincere apologies to Burl Ives, but we’re going heavy on the holly-jolly spirit this year! Bring in new, unwrapped toys (no weapons or violence-themed toys, please) to any LMCU location through December 15. They’ll all be donated to local children in need at area hospitals and schools. Visit lmcu.org for more details and a list of recipient organizations.